How Do You Brand a Coaching Business When It's Not All About You? Your coaching business is all about your clients, not you. So how do you market and sell Brand YOU? Below is an info graphic with some of the secrets of branding in today's world. At the bottom is a link to register for the new Q&A class called, "What Adele Can Teach You About Marketing". Learn the subtleties of branding when it's about you, but it really isn't. We'll look at some of the ways the singer, Adele, has mastered this for mega-success. And if you'd like to attend this one-time-only class for free, help us promote the class on Facebook or Twitter and we'll thank you with a guest pass! Branding a coaching business is subtle. The success of mega-star, Adele, can teach you some lessions about branding. If you'd like to join the upcoming class, click below. To get it for free, join School of Coaching Mastery on Facebook or @MasteryCoach on Twitter and share or RT our announcements about this one-time-only class. We'll give you a guest pass to say, "Thanks!" As a professional service provider, there are two things you must learn in order to succeed with coaching. 1. How to coach professionally: This includes polishing your coaching skills until you provide value worth approximately 10 times what your clients pay. 2. How to attract coaching clients: This includes filling your client roster for the first time (usually the toughest) and then keeping it full or even maintaining a waiting list of eager clients. Obviously, #1, providing 10 times the value, will help you with #2. But did you know that #2, attracting lots of coaching clients, is the key to #1? The data tell us that these two skills, delivering coaching value and attracting clients, comprise a constantly repeating feedback loop. One builds on the other and visa versa. That’s why some coaches are extraordinarily successful, while others seem to struggle forever. 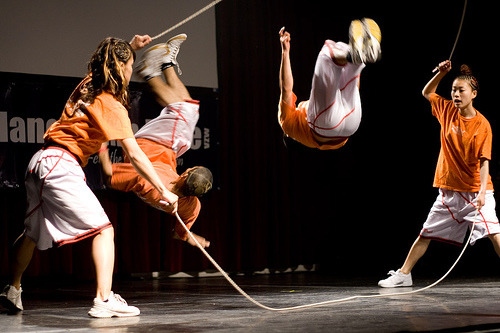 If you learned Double Dutch as a kid, you know that just getting into the game is a challenge, especially for the newbie. It takes courage, lots of energy and great timing. And staying in the game requires 10 times as much of all three. But that’s what makes it so darn fun. You might not think that science and data are fun or even appropriate for coaching. After all, coaching done well is an art form. But when the data teach you what to do more of and what to do less in order to succeed quickly, you get more of what you want faster. And your clients get more value. You’re in the loop. That’s more fun. Unfortunately, most coaches, especially those who are new, do not have access to data that helps them get what they want. You need a large sampling from your own business to get actionable data that can guide you. This requires that you start experimenting early and often. Think of experimentation as Play + Feedback = Rapid Growth. I’ve recently collected data on 22 coaches who have participated in Coach 100 in the past year. Coach 100 is a long-term experiment that teaches coaches how to get clients by offering complimentary coaching sessions. This gives them a large enough sample to get actionable data. Some Coach 100 coaches in my sample were brand-spanking new when they started the program. Others were long-time veterans. Collectively, they offered 464 complimentary sessions, or an average of 21 per coach. The most sessions offered was 106, by one coach, and the least, just 1 session each, by four coaches. That’s more than seven clients, each, or one client for every three complimentary sessions. That’s the average. Interestingly, the newbie coaches did almost as well as the veterans, especially the ones who coached the most people. That suggests they're learning really fast. Could you use 7 new coaching clients? Of course part of the treasure that the coaches receive is in the feedback they get privately from each person they coach via their Coach 100 Feedback Survey. c. helps them become master coaches and even get certified (remember: 10 times the value). Last but not least, Coach 100 gets coaches into that all-important feedback loop where they’re playing full out and simultaneously learn to deliver amazing value, while attracting plenty of clients. That’s where extraordinary success happens. Why? See those master Double Dutch players doing back flips, above? They’re performing in exhibitions and competitions. Think they practice hundreds of hours for those events? If they want to win, they do. Think they hone their craft with the feedback they get during every competition? Again, if they want to win. Lots of practice, lots of events, lots of feedback (data). That’s how you master Double Dutch. That’s how you win. Coaches need similar structures to get them into that feedback loop so they can master coaching sessions and master the science of getting coaching clients. The Coach 100 process does all that and gives a certification, too. Could you coach 100 people without the program? Theoretically, yes, but I’ve never seen anyone do it. It helps to have a structure that streamlines the process and supports the coach through to the end. Coaches need structure and systems to succeed, just like their clients. Want to win at master coaching sooner, rather than later? You may want to join a small group of high performers who are focused on filling their client rosters in about three months. I’ll be your personal mentor coach. Master the science of attracting coaching clients here. If there's one thing that makes some coaches (OK, a lotta coaches, especially new ones) feel kinda squeamish, icky, or dirty; it's marketing and sales. Makes you feel like you did when those snotty, dirty boys pulled your dress up on the playground. You're not that kinda girl! Okay, I'm being a little silly here, but if that's how you feel, it can get in the way of your success, Big Time. Unless of course, someone else is signing your clients on for you! So let's see if you can shift your perspective, here. Hmm...notice the word all those phrases begin with? Your ego doesn't belong in a coaching call. You probably already knew that, but how do you get your focus off yourself, onto the client, and still make a sale? Well, it's easy, once you get it AND until you get it, it's impossible! Well, these are pretty noble reasons and you may have noticed that there's a lot of "You" in there, again. But, what if you took "You" out? The noble stuff is still there and the phrases get more active. And your stuff is gone. If you're not in the picture, then your modesty, how you want to look and be, don't even matter anymore. The focus is off you and onto the action. Now you're ready to take action and make it all about the client. I'm not just playing word games here; this is real. Most clients will feel better about coaching with you if you let them pay you what coaching is worth to them. So that's the money thing. And then there's the rejection thing. If you're worried about it, then it's your ego again. Strangely enough, clients worry about rejection, too. That's why making an invitation is so important. If you're doing a complimentary session with someone who sounds like your ideal client, park your fear of rejection and make an offer. Otherwise, you may be denying the other person a beautiful opportunity to grow and have a new life. Get yourself out of the way and find out if they're ready to take a chance. Often, all they need is an invitation from you. 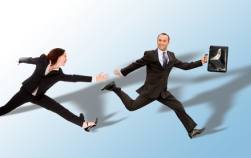 Good coach marketing and selling is just clean above-board communication and relationship building. Think about it. Part of being authentic is communicating honestly about who you are. That's integrity. If coaching is in integrity with your authentic self, then communicating about the gifts you have to offer the world as a coach, is part of your authenticity. If you're refusing to market and and unwilling to make a sale, a.k.a. communicate honestly and make invitations, then you're out of integrity. Your ego is in the way. Nobody is served. So if you feel uncomfortable with marketing and sales, I have a tongue-in-cheek suggestion for you: Stop thinking dirty. Start taking actions that help more people experience the benefits of coaching. In other words, fill up your coaching practice! Come on! You'll still respect yourself in the morning! This is a theme we visit again and again in Coach 100, but especially in C100 classes #5 &6, "Successful Complimentary Sessions, Part I & II", and class #11, "I Hate to Market!"